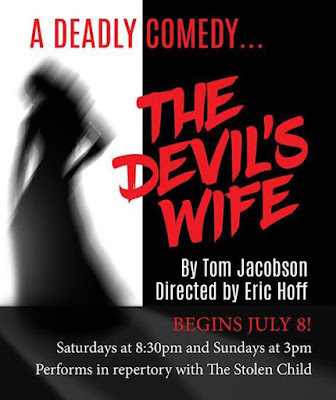 Sitting down to see The Devil's Wife by Tom Jacobson, the word "gothic" arose in my mind. Mostly because of the set--the dark curtains, the double chandeliers, the actual faint mist in the air. 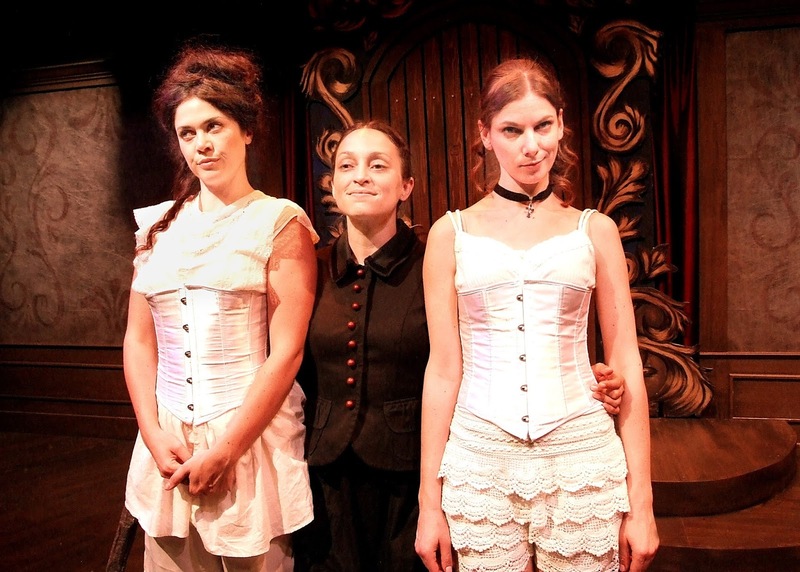 Sure enough, almost immediately we the audience met all three Ramirez sisters--beautiful and practical Bonita (Mariel Neto), cheerful and sensuous Dulce (Alana Dieetze), smart and forthright Sofia (Caro Zeller). All three return from their father's funeral, noting their mutual poor shared fortunes as well as their differences--shown in particular with their reaction to the strange fact of the sun shining while the rain pours down. What struck me next was a sense of style--a very specific kind of comedy, based on broad strokes that yet contain complexity and (as we learn eventually) some real depth. The plot reads like some kind of classic fairy tale or folk story, which I later learned did indeed inspire the whole play. 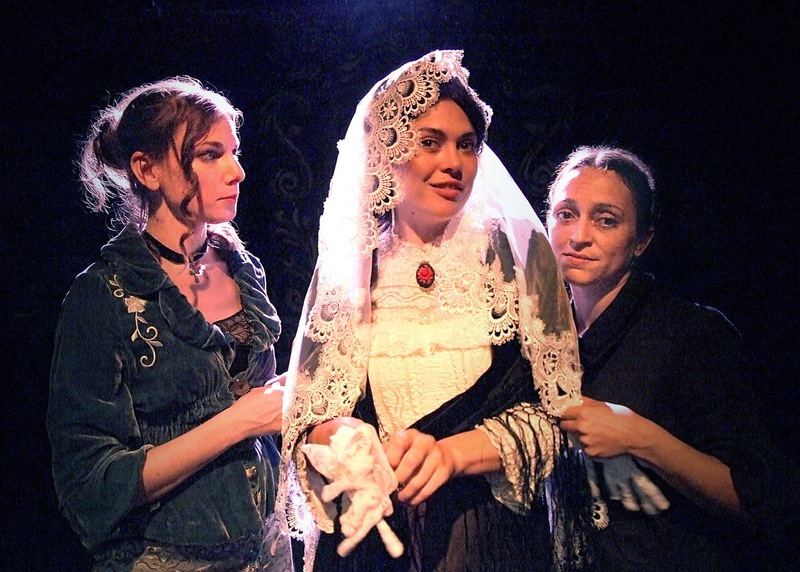 Three sisters (in the Western world we always meet that number) faced with a common problem. Finances. With lots of debt, no money but a large estate, what are they to do? Enter Nicolas Mastema (Everette Wallin) with a seeming answer. A contract of marriage, with one third of this estate to be taken in dowry but due to community property laws will remain in the family. Again, we get very different reactions, although all three ultimately agree to sign the contract. Bonita, the eldest, agrees to the deal even though she does not want to marry at all and fears the wedding night. Nicolas clearly prefers Sofia, who clearly shares the same attraction. Dulce on the other hand sees a very handsome man she'd like for her very own. In the midst of this is one puzzling detail. Their father gave Sofia a rough hewn staff, insisting it was important. Nicolas says their father won it off of him. He wants it back. Sofia insists on giving it as a wedding present. But while Nicolas proves in many ways a very patient husband, he does insist Bonita never ever open the basement door. He says it is a test of marital loyalty. As for what lies beyond the door--well, Dulce in particular has theories. Anyone with any knowledge of folks tales can predict what happens next. Sooner or later, Nicolas is going to need a new wife--and the contract stipulates any of the Ramirez sisters will do, and thus can save themselves from financial ruin. So after Bonita is gone, it becomes Dulce's turn (which in many ways proves very funny), Yet in time, Sofia weds Nicolas--not least because she cannot lie and say she does not already love him. Yes, she eventually opens the door. Yes, he really is the Devil. Yes, that staff proves very important. But no, I will not reveal what happens. Yet this show surprised me, in little things at first but then the growing complexity of the story and what it explores. Why for example would the Devil take time to personally interfere with this seemingly ordinary set of sisters? Even that answer proves to contain more than a few layers. How for that matter might a genuinely intelligent, even brilliant young woman react to actually meeting the Devil himself? Much less finding out she had married him? Where does God fit in? That this eighty-minute comedy actually deals with such issues without resorting to pat answers impressed me loads. 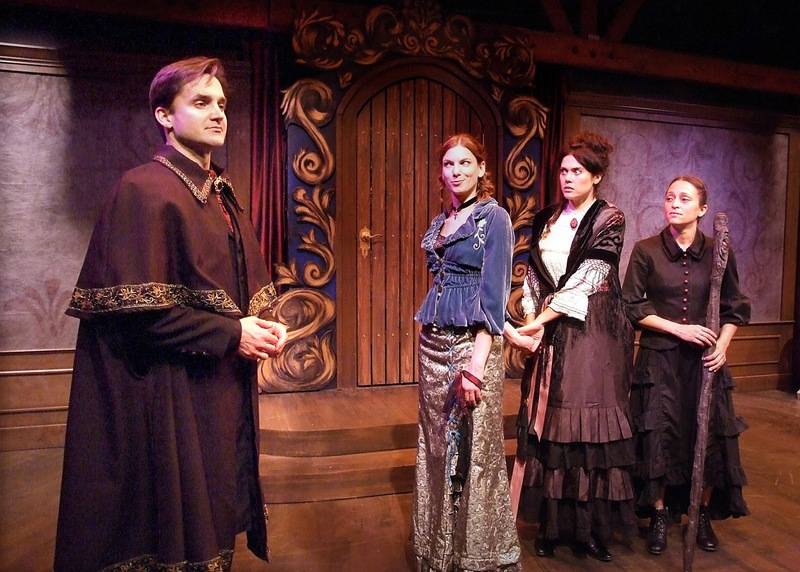 In that all the characters come to vivid life earns praise not only for the cast and playwright but director Eric Hoff. The Devil's Wife plays Saturdays at 8:30pm and Sundays at 3pm through August 27, 2017 at the Skylight Theatre 1816 1/2 North Vermont (just south of Franklin) Los Angeles CA 90027. Well, not really. Because there isn't that much to "spoil" in this case. 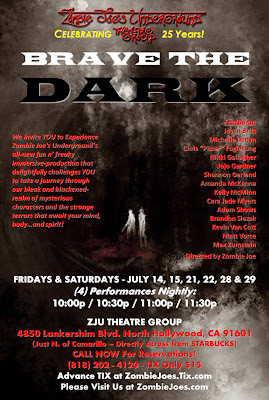 Brave the Dark (part of Zombie Joe's 25th Anniversay Season--an impressive achievement for any theatre goup) doesn't count so much as a play as a theatrical experience. One enters, eyes closed, hands on the shoulder of the person before you. At a certain point, we are told to count backwards from ten then open our eyes. Not too hard to figure out that what we experience this year relies even more on shadows, on things heard yet barely seen. Muffled screams. Gasps. Whispers. What look like faces and bodies writhing or maybe dancing or just maybe doing both. Hair as well as shadows obscure what should be faces. When we see an actual face, as often as not it grimaces in fear. The smiling ones are almost worse. We seem to have wandered into somewhere between worlds maybe--our own and something else. Nightmare maybe. Or purgatory. The lack of information might seem a weakness but the production uses it as a strength. Like these beings (are they people) who surround us, we the audience are lost. Fortunately we also may find our way out, beyond, back into the light. For a time, anyway. For the record, I know several members of the cast but didn't realize many were even in the show until later. Jason Britt, Michelle Danyn, Chris "Pisser" Foglesong, Nikki Gallagher, Jojo Gardner, Shannon Garland, Amanda McKenna, Kelly McMinn, Cara Jade Myers, Adam Shows, Brandon Slezak, Kevin Van Cott, Matthew Vorce and Max Zumstein make up the denizens whose lives/existences we glimpse/experience (sometimes smell--or are smelt). Other than one visit to classic horror, done with a nice visceral power, mostly these people and their lives remain echoes and shadows, vivid yet mysterious. During my tenure in This Place, the seeking for a story or even simple orientation kept me alert. I remain uncertain if there was a story and I missed it, or must I visit a few more times to really understand. 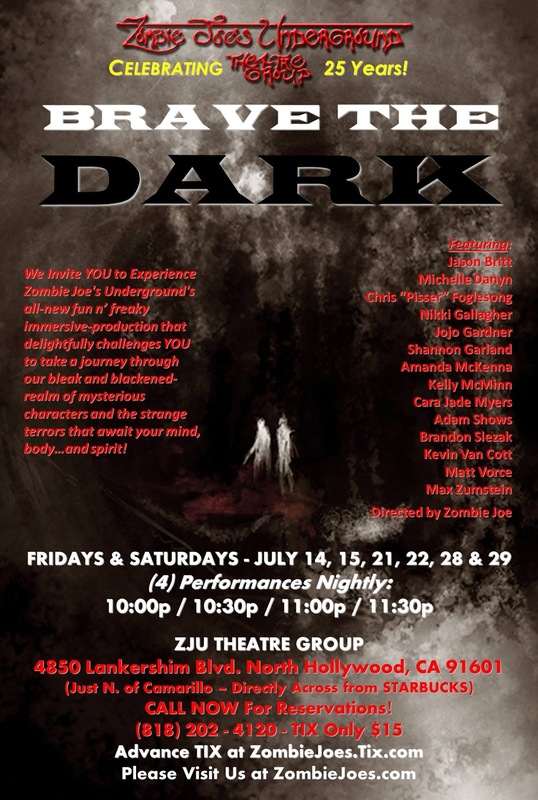 Brave the Dark plays Fridays and Saturdays at 10pm, 10:30pm, 11pm, 11:30pm until July 29, 2017 at Zombie Joe's Underground, 4850 Lankershim (just south of the NoHo sign, north of Camarillo) North Hollywood CA 91601. Thrillers tend to be tricky to pull off. A balance between believable and unforeseen remains vital, preferably pushed as far as one can go. Yet how to do that without straying into formula which bores (the cardinal sin in theatre especially)? An innovative style can work. So--and vitally--does a cast of truly vital, compelling characters. Then there's the twist on a twist on a twist. 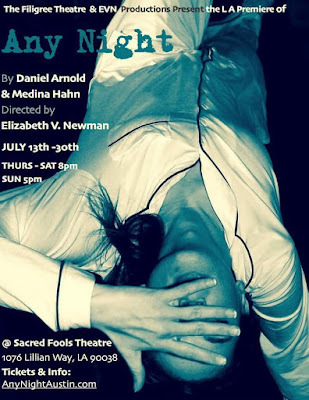 Any Night by Daniel Arnold and Medina Hahn takes the straightforward but daunting approach of all three! It makes for a harrowing seventy minutes of theatre, a step inside a nightmare where no one knows precisely what's real or not, on an ever spiraling number of levels. Apart from the utterly surreal set (Vanessa Montano's "set sculptures") the story only seems a tad unusual in that we see some kind of modern dance punctuate the scenes throughout. 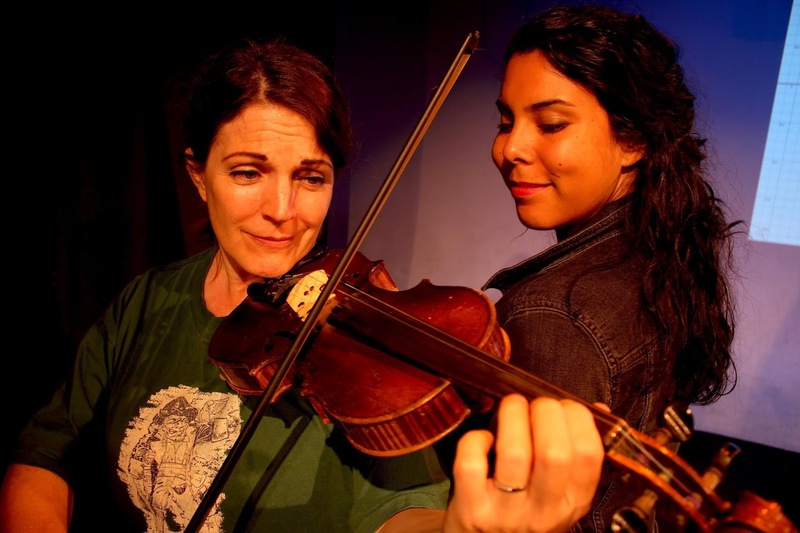 Erica Gionfriddo's choreography helps create the world of this play very well. Intimate, tension-filled, mysterious and somehow also desperate in some unknown, but specific, way. One brick at a time, this house of horrors goes up around us, escalating in complexity and strangeness--until at last enough of the edifice emerges for we the audience to recognize a shape. 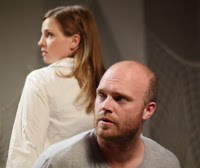 Anna (Marie Fahlgren) seems to jump back and forth between three distinct times. We only discover at the end what space/time the dance punctuations represent, although there we do begin. 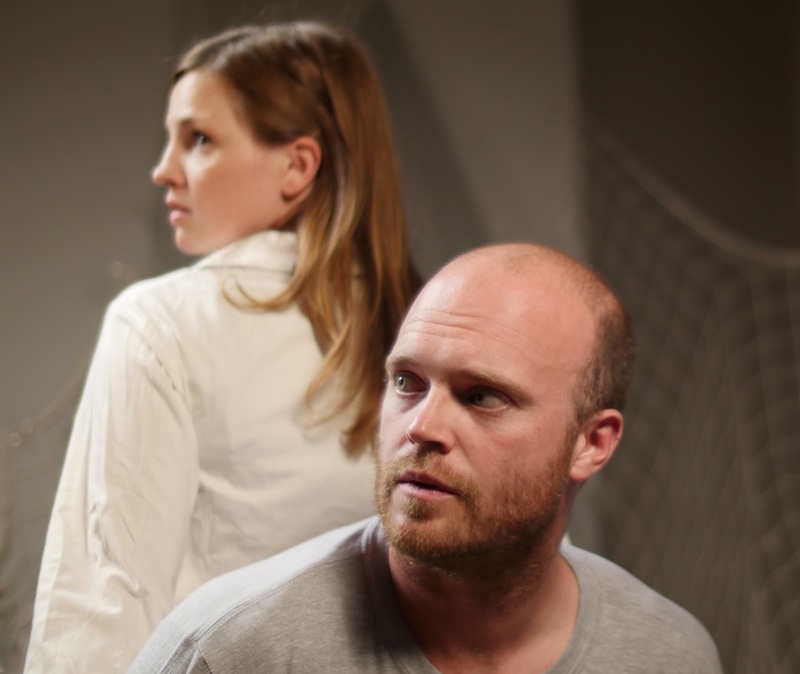 Most of the play involves her seeking out a home in the wake of a failed relationship. In a surprisingly nice basement apartment she meets Patrick (Zac Thomas), her new neighbor and the building's caretaker. He seems nice, if awkward. We hear in time quite a bit of his back story, but since it comes through the memory lens of Anna, how much can we be sure is true? For Anna is not well. Her third "place" is a hospital where she has been (is?) undergoing tests for a rare medical condition--one that ultimately killed her mother, who had it as well. Anna sleep walks, with a vengeance. She rises and dances, talks, does a variety of other actions pretty much every single night. Even more weirdly, she does all this while having truly vivid dreams (in fact, this is totally bizarre and indicates an extremely unusual condition--sleepwalking never normally accompanies REM sleep). She can wake suddenly in the midst of a violent attack on furniture or even people. Vandalizing her own home remains a possibility, one with precedent. Little wonder she clings so fiercely to this nice man who seemingly will do anything for her he can. Patrick meanwhile sees in her someone delicate and beautiful to touch and protect and share a thousand little joys. Because Anna's growing paranoia--hinted at, not least because of her medications, her own past traumas, the surreal quality of a life where she cannot always tell when she's dreaming--perceives a different possibility. Yet can we ever be certain if those perceptions represent insight or fantasy? Worse, can she? Director Elizabeth V. Newman certainly leads a gifted, disciplined team to create this fundamentally disturbing, nerve-scraping tale of love and loss, horror and despair, hope and desperation in such a visceral, intimate way. Ultimately the climax represents a reveal that explains almost everything--and yet in some ways almost nothing. It does haunt, though. Oh, yes. It haunts. Any Night plays Thursdays, Fridays and Saturdays at 8pm, Sundays at 5pm until July 30, 2017 at the Sacred Fools Theatre 1076 Lillian Way, Hollywood CA 90038. 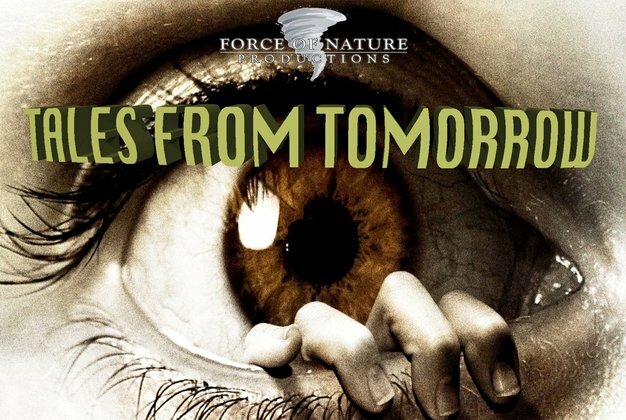 Force of Nature Productions does various anthology shows along different themes. Tales from Tomorrow consists of tiny plays about fantasy and science fiction, preferably with a twist. simply because I never get a chance to really know the violinist. 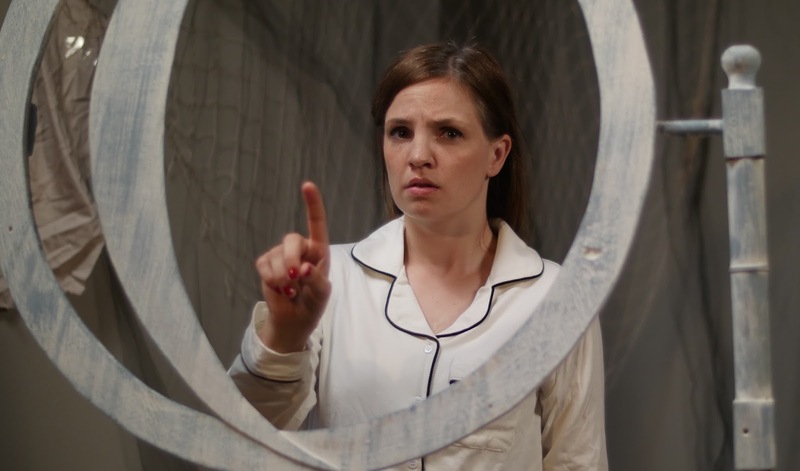 The Lottery (by Marnie Olson, directed by Corey Chappell) manages to a nice technical twist. The scene is between two very real characters, a father (Hansford Prince) and daughter (Gioya Tuma-Wak) a few decades in the future. They spend "Lottery Night" together every two years. The father feels nervous, since in three days he will no longer qualify and then his name cannot be called. The danger/mystery could have used some more intensity--what does this lottery entail after all?--but there simply wasn't time. And the twist was a good one, but I think the performances really shone. 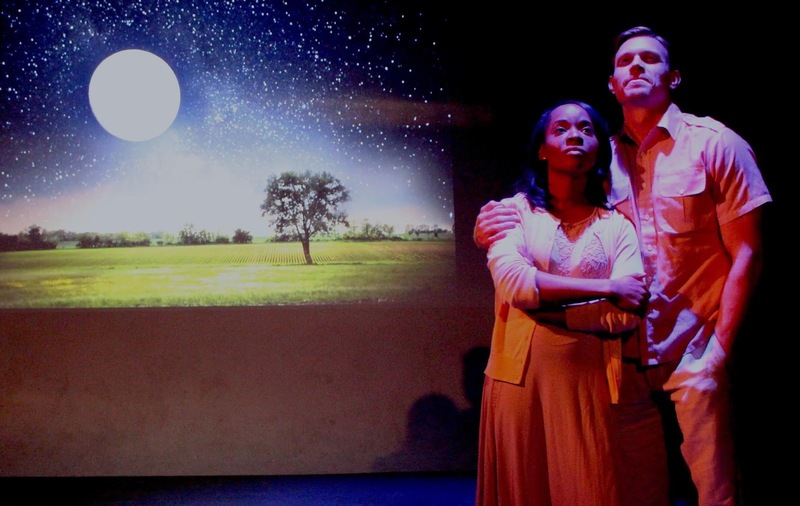 Starlight (by Andy Shultz, directed by Redetha Deason) introduces us to a young couple in love (Offi Ekah and Matt Penn) whose super-sweet romance feels threatened by his joining the army on the verge of a military campaign. Again, the length of the piece works against a real emotional wallop, so the twist at the end simply doesn't move us much. Everyone does a fine job, but frankly few subjects successfully lend themselves to this length. I cannot put my finger on anything wrong, nor can I call it boring. But we simply don't know these people well enough to really care very much. 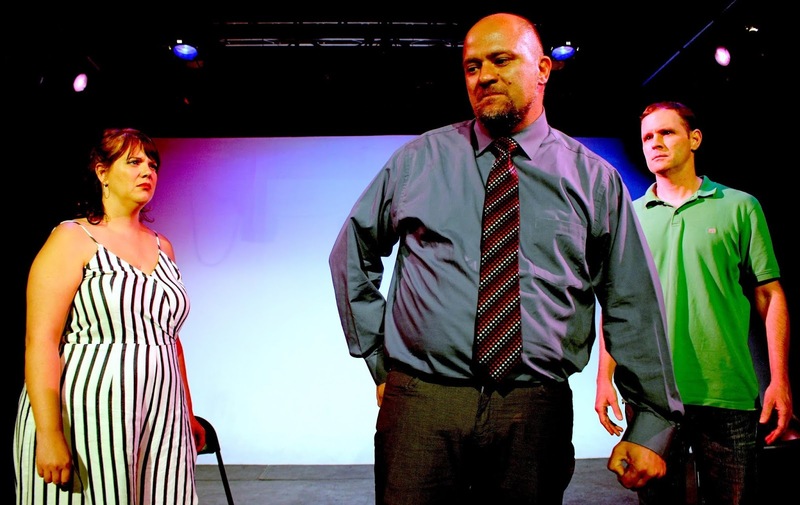 Pretend Roses (by Tom Jones, directed by Sebastian Munoz & Andy Shultz) on the other hand is one of those that succeeds on its own terms in this short format. 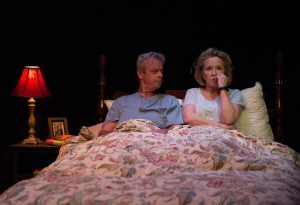 A therapy session between a man (Jason C. Daniels), a woman with whom he seems involved (Carrie Muniak) begins even before the Therapist (Jerry Chappell) shows up. The genuine pain all three seem to be enduring, having grown to the point of demanding the truth one way or another, plays out startlingly well. I won't even spoil the twist, even though I did figure it out--a fact that took nothing away from my experience. 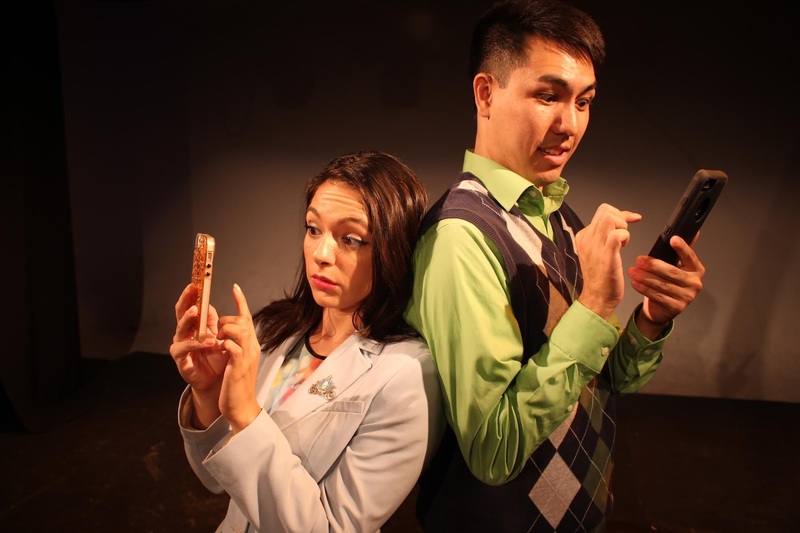 Swipe Left (by Thomas J. Misuraca, directed by Sebastian Munoz & Andy Shultz) rounds out the evening with a lot of laughs. A young woman (Olivia Sundeen) waits for her blind date (Sam Grey), who runs late. When he arrives, she expresses her dissatisfaction by "swiping left" on her smartphone, changing his behavior! Does this sound funny? Believe me, it ends up delivering more laughs than promised! In no small part because the two cast members continue to shift between personality traits, preferences, attitudes, body language, etc. over and over and over again. Overall a very enjoyable set of shows. 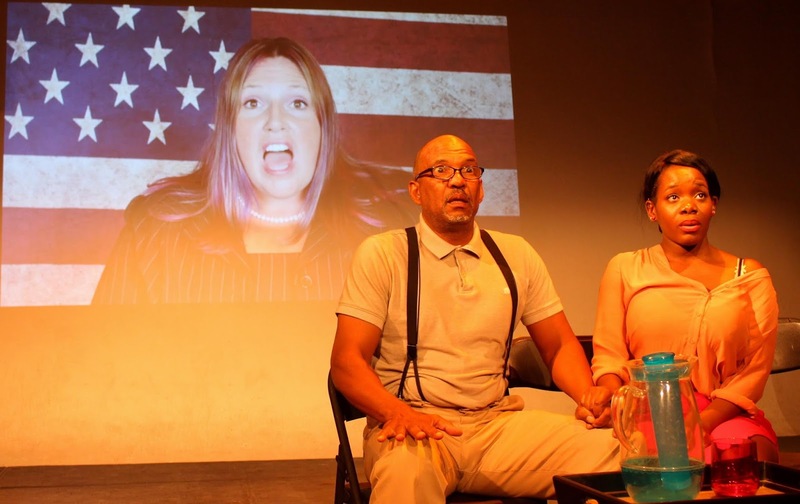 Tales from Tomorrow plays Sundays at 7:30pm until July 23, 2017 at the Studio/Stage, 520 North Western Avenue (just south of Melrose), Los Angeles CA 90004. 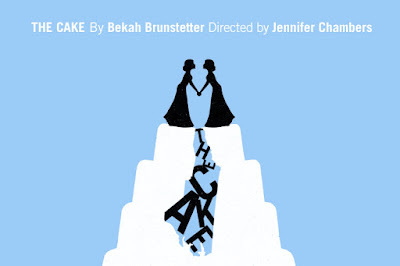 Someone I know recommended Bekah Brunstetter's The Cake to me. Given the Echo Theatre Company is mounting it, I needed little encouragement. At the time, though, not even having seen the poster, what I didn't know the subject matter. Now I do. 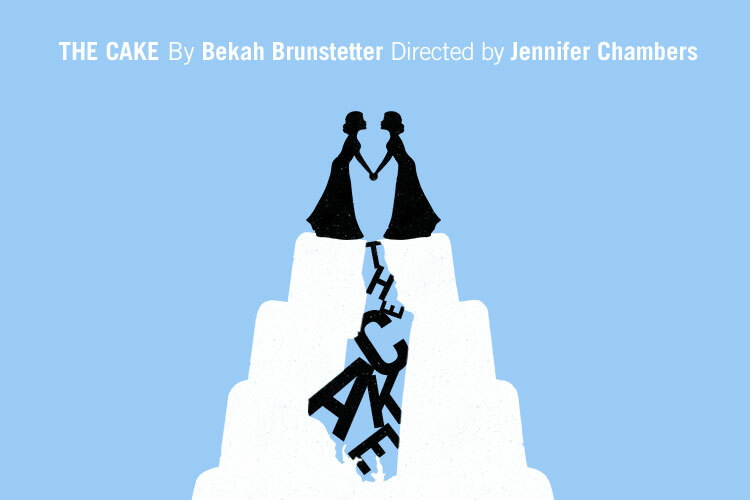 The Cake of the title refers to a wedding cake for a ceremony between two women, one of whose oldest friends (and best friend to her late mother) feels compelled to refuse to bake. Okay, that was a convoluted sentence. Let me give it another try. 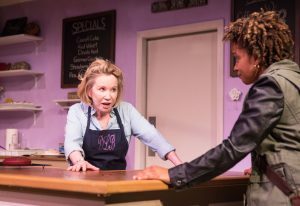 Della (Debra Jo Rupp) feels immense pride in her skills as a baker, in particular her cakes. 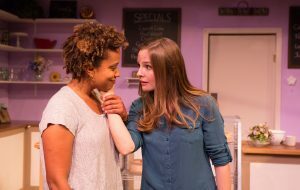 She runs a bakery in Winston-Salem, North Carolina and starts the play with her baking philosophy. Follow the directions. Which is pretty much her life's philosophy as well. To this she attributes the quality of her cakes, not to any skill on her part--a factor both charming and a tiny bit sad. Now she's been invited to participate in a t.v. show, The Great American Bake-Off and expects this philosophy of no improvisation but rigid following what has gone before will lead her to victory. Again, both charming and a little bit sad. But not quite that simple, either. She's explaining all this to a visitor from New York named Macy (Carolyn Ratteray), a young woman aggressively if charmingly uber-liberal in all kinds of stereotypical ways. She calls sugar and milk "poison," assumes the The Great American Bake-Off is fixed, insists she's gluten sensitive (a dietary buzzword if there ever was one), sees everything in terms of corporate conspiracy, etc. Clearly the two of them don't really get along, but both prove ultimately too nice as well as too polite to let it become an argument. Then, enter Jen, formerly Jennifer (Shannon Lucio). The daughter of Della's late best friend, clearly someone Della sees as family. Back home from New York for the first time in oh so long and now engaged to be married! Wow! Fireworks! Of course Della insists she must make the wedding cake! Until she finds out Jenn is going to marry Macy. Honestly, this could so easily have become a polemic and a fairly boring one too. We the audience will almost certainly remain firmly on Jenn and Macy's side, thinking Della wrong. Including me. Such remains absolutely my view! Yet all the while, efforts to portray everyone involved as fundamentally human, each with a story worthy of telling rather than dismissed prove so very successful. Much of that does indeed lie within the script. Macy remains so very annoying in her self-righteousness. Della comes across as so kind, so reluctant to hurt anyone and deeply ashamed of doing so. We see Jen's genuine torment feeling torn in two by different sets of values, each with flaws and virtues (in a less subtle work her name might well have been Columbia if not America). Likewise Della's husband Tim (Joe Hart) emerges as a well meaning man, one living with some deep pain of his own and demonstrating a nice ability to do more than judge. Another example of how the cast directed by Jennifer Chambers really does do some wonders. All of which leads not to a simple reconciliation or healing, no clear-cut compromise or simple forgiveness all around. No. We might expect that. Or we might think the two sides in the story would flatly refuse in the end to have much to do with one another. No listening. No consideration. Just fierce and unyielding contest to the death of...well, somebody or something. Which feels nice. It feels hopeful. It also, in the current climate, feels somehow false. But that also means it makes one think. The United States contains literally hundreds of millions of people. Aren't plenty of them this kind, this civilized, this fundamentally nice--pretty much all along the political spectrum? In fact, when I think on it some very lovely human beings I've known were pretty right wing, even expecting/hoping the world to be destroyed pretty soon. Just as some of those with whom I share opinions exhibit as much strident unwillingness to listen as any Alt.right racist. And everything in between. Because this is not a tale of great issues or political movements. Rather it tells of an important series of events between members of an extended family. An intimate, small scale story. The kind which rarely ends up in history books yet makes up the vast majority of human interactions, really. Herein therefore lies a special commodity: Hope. 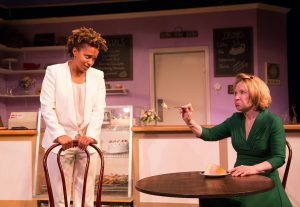 The Cake plays Thursdays, Fridays, Saturdays and Mondays at 8pm, Sundays at 4pm until August 13, 2017 (with a Wednesday performance August 9 at 8pm) at the Echo Theatre Company, Atwater Village Theatre, 3269 Casitas Aveneu, Los Angeles CA 90039.